Magic Bullet Suite installer says "Wrong Version." Where do I download Looks v1? If the product installer is not accepting your Magic Bullet Looks v1 serial number or if the installer displays "Wrong Version", please check to be sure you are installing with the Magic Bullet Looks v1 installer and Not the Magic Bullet Suite Product Installer. The Magic Bullet Suite Product Installer includes Magic Bullet Looks v2, a Looks v1 serial number will not unlock this version. Download Magic Bullet Looks v1 on the Legacy Versions download page. If you have a license for Magic Bullet Looks v1, you are eligible for special upgrade pricing for Magic Bullet Looks v2 and Magic Bullet Suite. 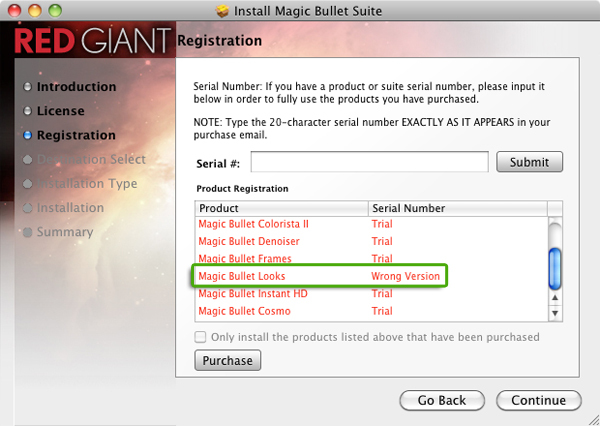 If after downloading Magic Bullet Looks v1 and your serial number is still not accepted, please complete the instructions here. First run the Magic Bullet Suite Product Installer 11, input all of your product serial numbers for Magic Bullet Suite 10, except for Magic Bullet Looks v1. Remember to click Submit after entering each serial number. Check the box "Only install products listed above that have been purchased" and then complete the rest of the installation process. After installation is complete, close installer. Next, run the Magic Bullet Looks v1 installer. Magic Bullet Suite Product installer 11.0 is displayed.